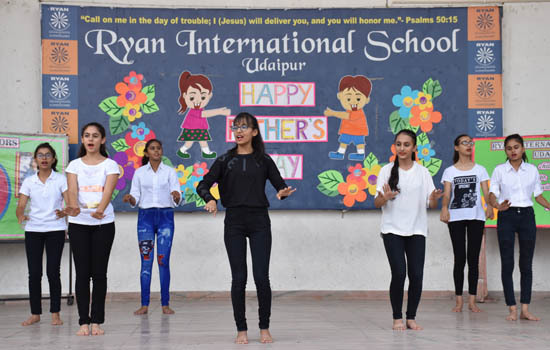 To salute this form of unconditional love , Ryan International School , Udaipur celebrated the event of Father’s Day on 23rdjune 20-18. The program began by invoking the blessings of lord almighty, students read the bible verse which was followed by special prayer and melodious prayer songs. Ryan Udaipur took immense pride in inviting the fathers and making them a part of the celebration at school, which was exclusively for them. It was a day off from their usual routine. ,where the Fathers were being welcomed in a very special way, which gave them a chance to bind with their children in a fulfilled ambiance. It was a pleasure to see fathers participating in different fun activities including flameless healthy tiffin , drawing ,painting or sketching (theme: World of Happiness) ,singing and dancing and playing different fun games. Students sang melodious song , dedicating to their fathers , recited medley of poems, danced and presented a very heart touching skit which hailed the atmosphere with love, respect and sense of belongingness. Everyone enjoyed and praised the performances of the students and the arrangements done by the school . Principal of the school Mrs. PoonamRathore appreciated the strong bond between father & son and father & daughter and also wished them to maintain a healthy relation of love and understanding.